Information technology (IT) governance has assumed a prevalent spot in technical and management publications. When academics and practitioners alike pose such questions as "Does IT matter? ", those of us in the IT field cannot help but to sit up and take notice. We must manage with a focus on articulating the value of IT investments so that the CEO understands what a dollar spent on technology yields in real earnings impact. We must also focus on helping the CIO feel comfortable with balanced risk exposure. The development of a management system that ensures IT can consistently deliver on these objectives is what IT governance is all about. 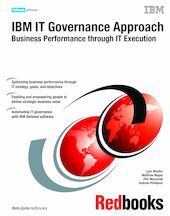 These lessons are codified in the IBM IT Governance Approach, which you instantiate within your organization. By applying this approach with the guiding principles and automating with technology, you will yield a governance solution that is adopted and viewed as an enabler to your teams. Most importantly it will ensure that IT delivers its mission to add measurable business value and reduce risk to the business.